Throughout his life Nathaniel Hawthorne was influenced by the various women who surrounded him. As his biographers have demonstrated, women often played crucial roles in his development. His mother, Elizabeth Manning Hawthorne, and his sisters Elizabeth and Louisa encouraged him in his aspirations to be a writer. His grandmother and aunts in Salem supported his early education. His wife Sophia (Peabody) devoted herself to him and inspired some of the female characters who appear in his fiction. Hawthorne also had important relationships with women who affected his professional life, including Elizabeth Peabody and Margaret Fuller. Some critics see Fuller as another inspiration for some of Hawthorne’s female characters, particularly his strong, rebellious figures. In his short stories and romances, Hawthorne creates a wide range of female characters. Some are strong, independent-minded, and self-confident, like Hester Prynne or Zenobia. 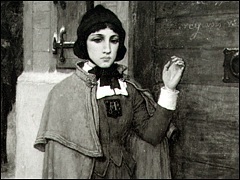 Others embody the gender expectations for women in Hawthorne’s day, such as Phoebe Pyncheon. Many of his female characters serve as redemptive figures for men who have isolated themselves or severed their ties to a sustaining community. Hawthorne also presents a number of female characters who are victimized at the hands of men, destroyed by exercises of male power. Through these various characters and their experiences, Hawthorne explores the nature of gender relations in his day. He also raises questions about the role of domesticity in shaping female characters and the role of emotion as well as reason in human experience. In some works, Hawthorne presents older women as central figures and through them explores the legacy of the past and the ways in which women are shaped by their individual and community history. Sympathetic to most of the female characters who appear in his works, Hawthorne presents the complexity of women’s lives at times of profound social change, whether in his own day or in the historic past.